This is a new Monitor Yoke for the Zephyr HD Marshall Monitor, but will of course fit all 7" Marshalls with the similar design. As you can see in the photos your Monitor will tilt on it's cg without affecting balance with this bracket. Switching to low-mode is a breeze - no unscrewing and remounting anything, you don't even need to flip the image on the monitor! 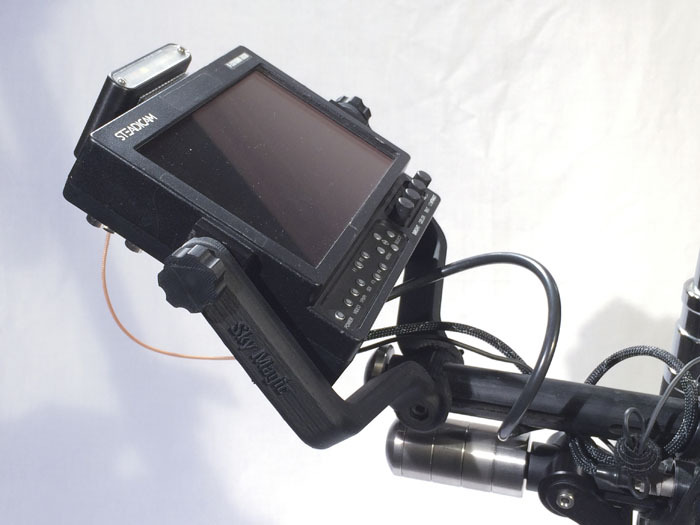 It comes with all necessary screws and fits right onto the Zephyr rods, so it frees up the original monitor mount as an accessory mount. from the mounting plate on the rear of the monitor you can remove, which in turn also helps with better heat dissipation from the monitor. Rosettes make the positioning rock-solid, no vibrations or slippage. USD 150 / EUR 110 plus shipping (plus VAT if you're in Germany). USD 15 / EUR 10 gets your name embossed on it (will look like the "Sky Magic" logo that's on it in the pictures). Another accessory, very well thought out, well done. I keep waiting for more updates Zephyr, a small but professional look. I'm wondering if this kit would work on the Pilot too? It should make switching to low mode a whole lot easier assuming the current Pilot HD monitor cg is also in line with it's centre 1/4" mounting holes. I've looked around for a monitor yoke I could adapt and came across your post here, which looks like the perfect thing. 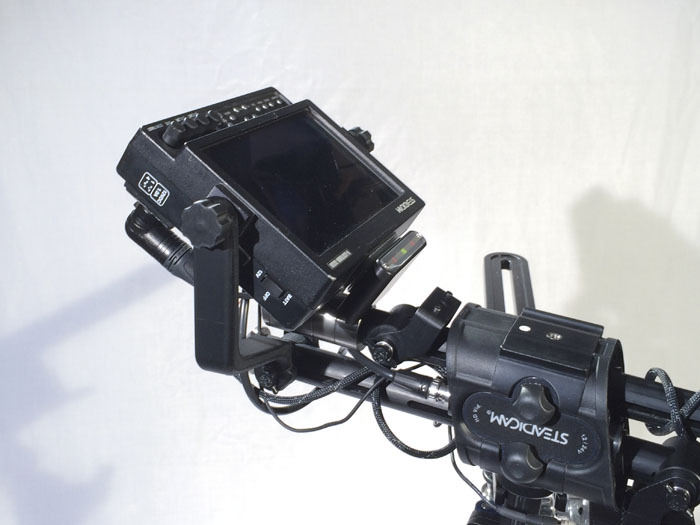 The monitor I currently have has the new 7" SWIT S-1071HS monitor Tiffen are now shipping with the Pilot HD and in the future I might want to mount a Convergent Design Odyssey7Q to use with our Sony NEX-FS700 camera for the recording options it provides. Would it be possible to adjust or adapt this to mount 139mm and 155mm widths (and switch between them as necessary)? It'd be a good investment for the long term too, because ultimately I'd love to upgrade to a Zephyr at some point and would still be wanting this feature. 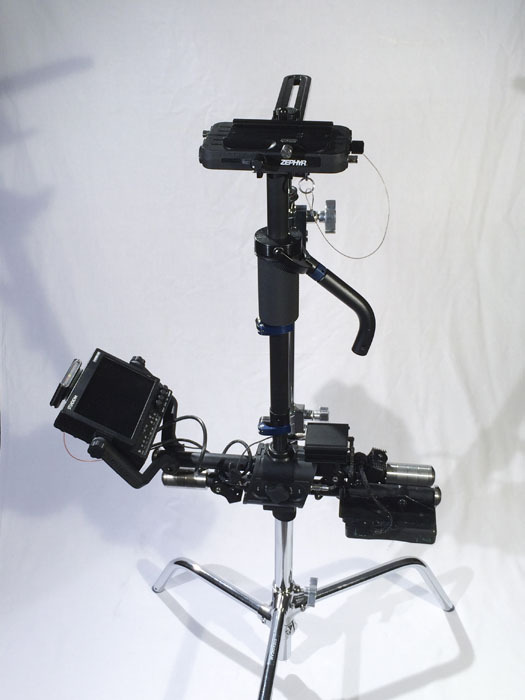 The base on the pilot is very similar, and for the purpose of mounting this, the same, so yes it does fit the pilot! And you are absolutely right, all the advantages it has on the Zephyr will transfer right to the pilot, and even more, it weights next to nothing, so it's well suited for the Pilot. Also, I am happy to adjust it to your monitor of course, I will look at the swit and the oddysey and get back to you via message next week. The real difference will be yokes for the different widths, so for 200mm or 192 (while I think that 8mm could easily be bridged by some kind of washers actually, so that should be no problem at all). Both monitors you mention already have 1/4" mounting holes right where you'll need them for this, so thats awesome! The yoke is currently tested and some final refinements are made with the help of a few people that are using it so far (thanks so much guys!! ), and will be fully ready as a final product soon! If there's an easy way to size one yoke for different monitors just by adding or removing a washer on each side, that'd be a good solution for many people I imagine. And yes, a grip for the Pilot would be fantastic because it's not an ideal size tube for the operating hand to properly wrap around (at least it feels that way to me). 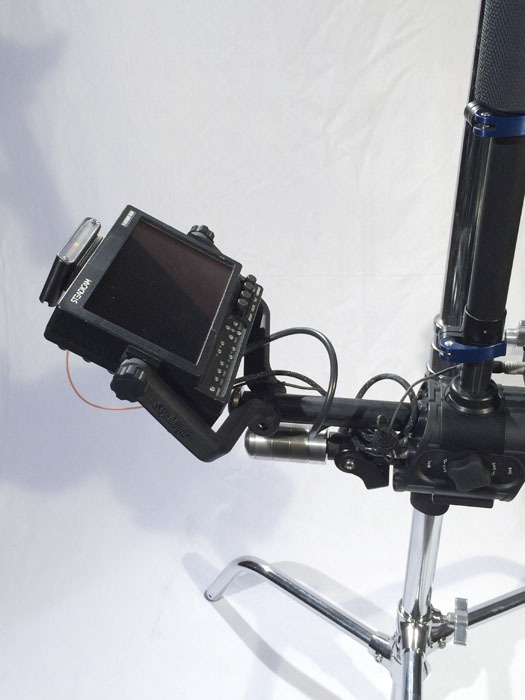 If you do make a grip for the Pilot, how would you make it easily adjustable given there's no existing grip as part of the gimbal? 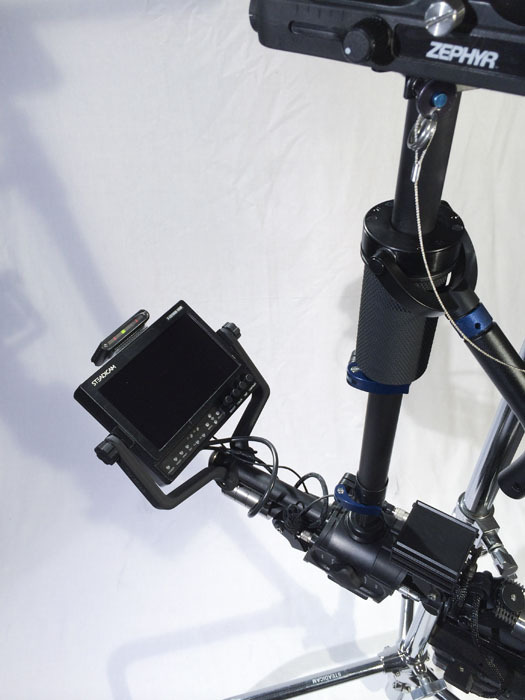 Perhaps that could be solved simply by using the same sized allen style screws that the gimbal uses so you can use just one T-handle allen wrench to adjust the lot very quickly. GIad you like the idea, I had a pilot for a long time and never liked the tiny diameter. Have a great weekend Jamie and everybody! I totally concur and a friction type release sounds even better, so I hope that one works out! I've been using one on my rig for a few weeks, now, and I love it! Much more solid than the original monitor mount, with improved flexibility for monitor position. If you have a Zephyr, this is a no brainer. It's an easy way to upgrade your rig. Hey Frederic. I love the design. In sure I'll order one from you. You mentioned that it's ABS plastic; is it injection molded? It's actually 3D-Printed, but on a really expensive high precision professional machine. 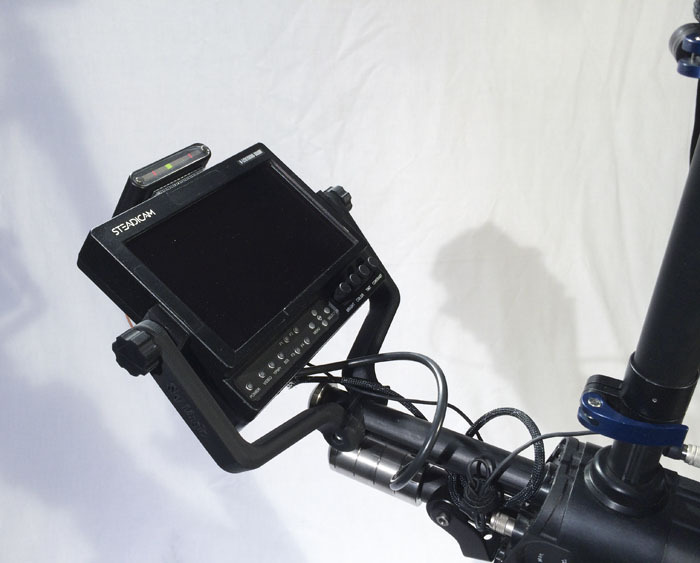 I ordered this monitor yoke and the Pilot gimbal grip for my Steadicam Pilot and both are brilliant upgrades for the Pilot. The grip is fantastic, I'd say essential for the Pilot, I love it! The difference is night and day better. 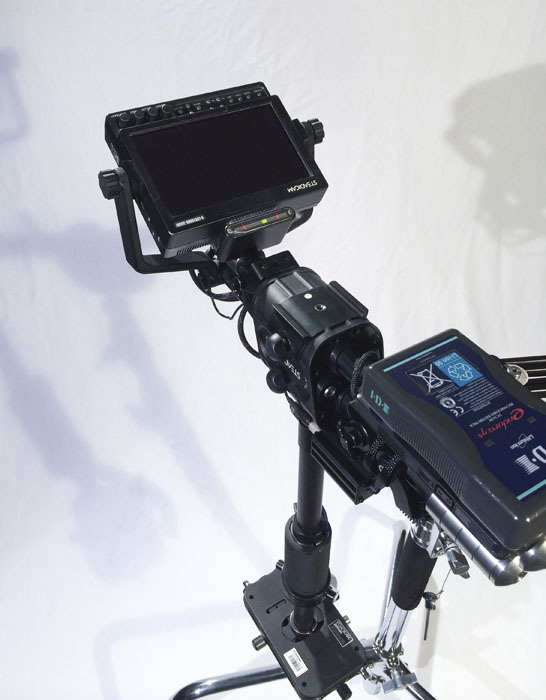 The monitor yoke gives so much more flexibility in the position of the monitor, which makes it much easier to get it somewhere you can actually see it and still balance the rig, plus the more obvious advantages of changes of monitor position without upsetting the rig balance and easy switches to low mode. It's also worth mentioning that Frederic is very personable, helpful and easy to communicate with! Thank you for your kind words and your awesome photos Jamie, those are very, very cool! 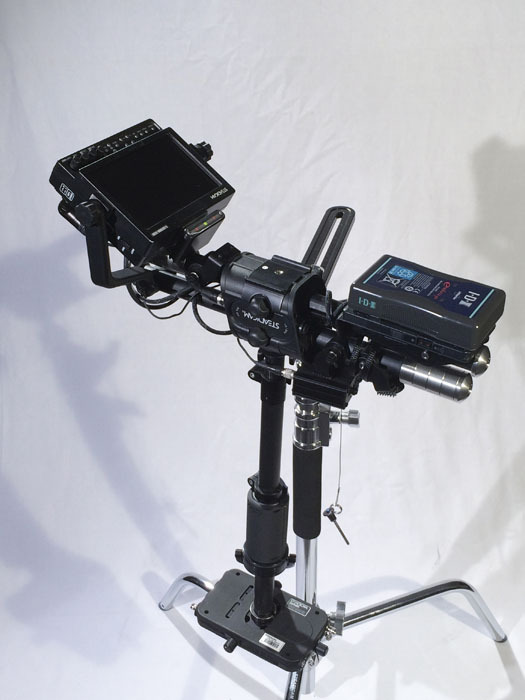 And I should have also mentioned so people know this is possible, that you made the monitor yoke custom fitting so that it will work both with the Swit monitor that came with my Steadicam Pilot HD and also my eventual planned purchase of a Convergent Design Odyssey7Q. I'd like to add my positive comments to those above about Frederic's fine work on the Zephyr accessories. 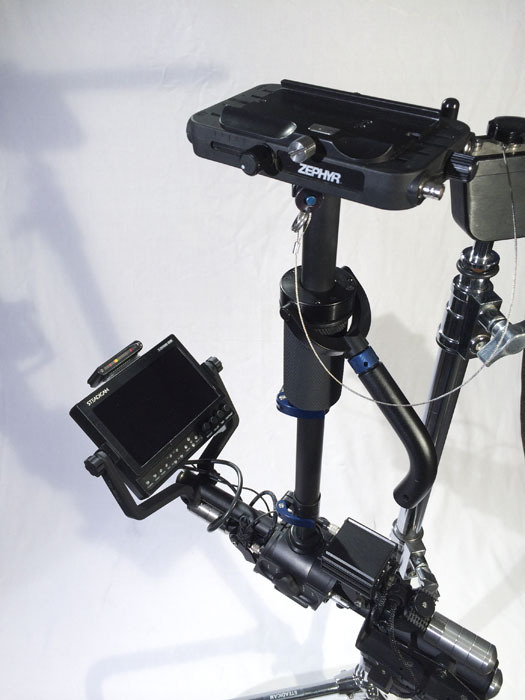 I purchased both the monitor yoke and the gimbal grip, and they're great additions to the rig. The yoke is particularly helpful for speeding up the process of going from normal mode to low mode. Indeed he's a fine person to communicate and do business with. Thanks again Frederic!